MBC Services, Inc. needed quick and affordable invoice form printing and design services. Being a local remodeler, their business form needs were simple; but having a professional brand image on every form is important for every size business. Printed in black ink on a 3-part carbonless stock with repeating copy on all sheets, the forms measure 8″ wide x 7″ tall. Red consecutive numbering was used in the upper right corner. 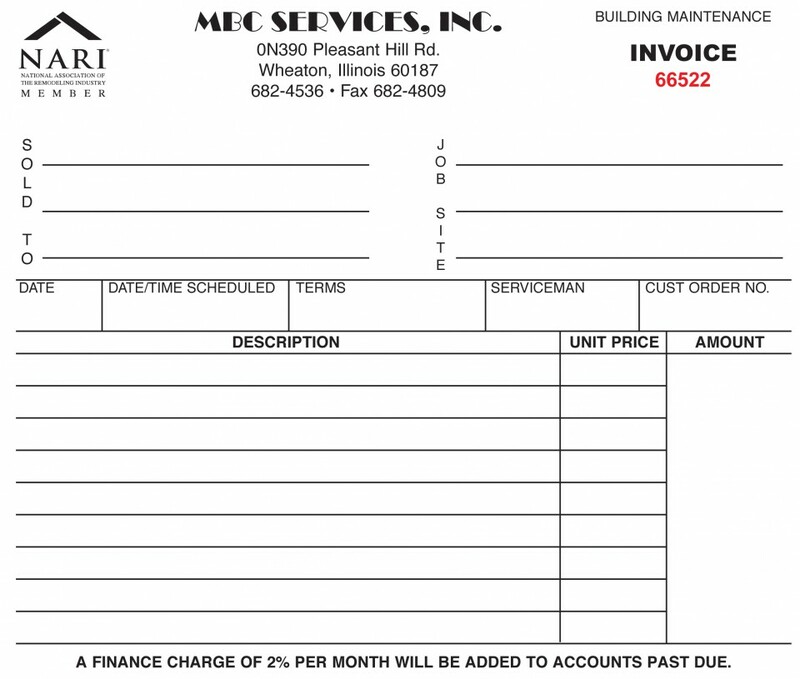 This invoice design also doubles as a work order form by allowing enough space for job details to be written in. Standard turnaround for invoice form printing is 3-5 days from proof approval. dream ink is your #1 source for finding the best press for your project. We work with several local wholesalers and commercial printers who we competitively bid each project with. Our experts are on hand to help your business make informed purchasing decisions when it comes to print media. Whether you need full color, thermography, specialty or invoice form printing, we can help! Our network and knowledge of production help find you find the best price, press, and production method to meet your print job’s needs. Visit our Printed Products page for more info or call today for a free quote!